Home Gadgets [PROMO ALERT] Haier is Chillin’ Summer until June 30! 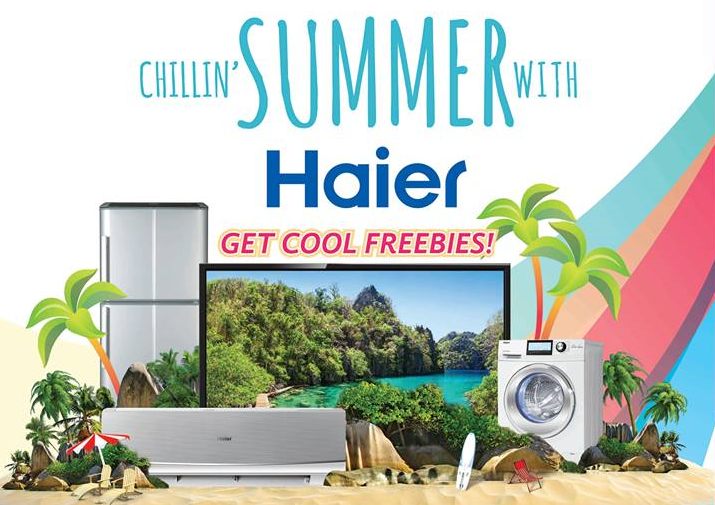 [PROMO ALERT] Haier is Chillin’ Summer until June 30! Mild drizzles and overcast skies have frequently been making appearances lately, signalling that summer is winding down; but don’t put away your sunscreen and beach hats just yet because the sun keeps shining over at Haier, with its Chillin’ Summer Promo. Make the rest of your summer count by making Haier a part of it, and let the summer fun continue! Choose to buy a Haier or Sanyo appliance from specially selected items and score a cool freebie to take home for free! Each purchase has a corresponding freebie that you and your family can enjoy and even take on your pahabol summer vacations. So head on to the leading appliance stores near you and start enjoying some hot home appliances, and the free gifts that come with them. For every 32-inch or any bigger size LED TV you get the chance to choose between a 5400 MAH power bank that’s surely useful for long drives to the beach, and a wall bracket for that new screen of yours. Wanna chill? Then get a Haier or Sanyo refrigerator! Whether it’s a single door or a two-door you’re eyeing, the choice is yours between a free Rubbermaid Food Keeper + 3 Sports Bottle or a Rubbermaid Food Keeper + 1 Chug Bottle + Slotted Spoon. If you’d rather get a 1/3 gallon Coleman Cooler Water Jug or a Sanyo pressure cooker, then buy a 2-door no-frost refrigerator instead. A window type air conditioner (AC) can get you free AC brackets while a split type will come with a 1/3 gallon Cooler Water Jug from Coleman or a P3,000 Installation Subsidy. Get a 500g Surf Blossom Fresh w/ Fabcon Detergent when you buy a single tub washing machine. Make it a twin tub and score a Rubbermaid Food Keeper + 3 Sports Bottle or Rubbermaid Food Keeper + 1 Chug Bottle + Slotted Spoon. Beat the heat with a free air cooler when you purchase a front load washing machine, and a Sanyo pressure cooker when you buy a Fully Automatic Washing Machine or a washing machine dryer. What could be a cooler deal than that! To avail of your freebies, just present a proof of purchase from the same store where you bought your items (except for the P3,000 subsidy for the wall-mounted air conditioning system, for which you will be referred to call the Haier hotline), within 60 days of your purchase. Find out more about this promo and other cool products, visit and like Haier Philippines’s Facebook page or call the Haier hotline at 1-800-8-9999999 for Globe subscribers, 1-800-10-9999999 for PLDT subscribers, or get in touch with the customer care center at (02) 883-9999.